Despite the rise of a human rights–based approach to health and increasing awareness of the synergies between women’s health and empowerment, a lack of consensus remains as to how to operationalize empowerment in ways that improve health. Women’s Empowerment and Global Health presents thirteen multidisciplinary case studies that demonstrate how science and advocacy can be creatively merged to enhance the agency and status of girls and women. The book is organized into two sections, the first focused on sociocultural, educational, and health systems interventions, and the second on economic, policy, and structural interventions. Seven of the chapters are enriched by complementary videos that provide readers with context about programs in India, Kenya, the United States, Mexico, Nicaragua, Zimbabwe, and South Africa. Women’s Empowerment and Global Health provides the next generation of researchers and practitioners, as well as students in global and public health, sociology, anthropology, women’s studies, law, business, and medicine, with cutting-edge and inspirational examples of programs that point the way toward achieving women’s equality and the positive outcome of empowerment on health. 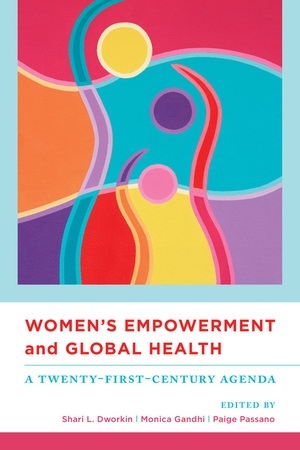 Research presented in this book was completed with the support of University of California Global Health Institute’s (UCGHI)Center of Expertise (COE) on Women’s Health, Gender, and Empowerment, whose leaders and members comprised the editorial team. Chapter authors include representatives and grantees from world-renowned organizations working at the intersection of women’s health, gender, and empowerment, including the Bill and Melinda Gates Foundation, CARE International, Department for International Development, GirlHub, National Institute of Health’s Fogarty International Center, Nike Foundation, Packard Foundation, Population Council, Public Health Foundation of India, Sonke Gender Justice, and UNICEF. Shari L. Dworkin is Professor and Associate Dean for Academic Affairs at the University of California, San Francisco, School of Nursing. Monica Gandhi is Professor at the University of California, San Francisco, School of Medicine. Paige Passano is Program Officer at the University of California, Berkeley’s OASIS Initiative, a project of the Bixby Center for Population, Health, and Sustainability and the College of Natural Resources.